Almost three-quarters of new users in NSW took performance- and image-enhancing drugs, predominantly steroids, according to the latest Australian Needle Syringe Program survey. Demand among young men wanting rapid muscle gain has tripled in the past decade, sparking alarm about the health risks of steroids, including increased violence by some users. 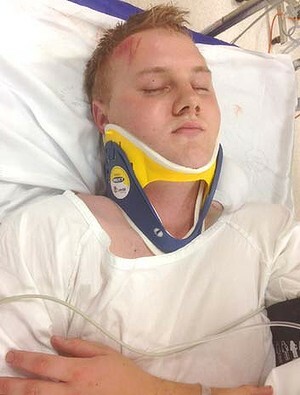 Latest victim: Alexander McEwen lies in hospital with a fractured skull. Concerns were highlighted on Sunday when police reported finding 13 vials of steroids at the Kingswood home of Corey Beard, 21, after he allegedly attacked 19-year-old Alexander McEwen, putting him in a coma. The 2013 needle syringe program survey, by the Kirby Institute at the University of NSW, found 74 per cent of people in NSW who started injecting illicit substances in the past three years had sought out performance- and image-enhancing drugs, compared with only 27 per cent in 2003. The survey of 2400 injecting drug takers, to be published in May, found only 11 per cent of new male users preferred methamphetamines, down from half of respondents in 2006. The median age of those surveyed in 2013 was 27. Survey co-ordinator Jenny Iversen said the surge in new users of performance- and image-enhancing drugs was linked to the increased availability and diversity of such substances. Performance- and image-enhancing drugs are generally used to increase muscle growth or reduce body fat. The health risks of steroids include liver damage, cancer, heart problems and increased levels of aggression. While overall use of such drugs remains low, the cohort of people taking steroids is growing. “Steroids used to be around sports to improve performance but increasingly they’re being used for aesthetic purposes,” said drug educator Paul Dillon. Surveys showed high doses or chronic use of steroids increased the risk of aggressive or violent behaviour, he said. Some users also reported mood swings, grandiose ideas and loss of inhibitions and judgment. But the link between steroids and aggression – often dubbed “roid rage” – was overstated, he said. Some steroid users might be predisposed to violent behaviour. Aggression might also be linked to social factors, such as the user’s peer group, Mr Dillon said.